Congratulations! You passed the bar! There aren’t many things that will compare to the sense of accomplishment, elation, and relief that you feel when see your name on the bar exam pass list. But that excitement can quickly fade to feelings of frustration, disillusionment, and even embarrassment if you haven’t landed a legal job. You’re finally a lawyer, but it may all seem a bit anti-climactic if you’re still unemployed. If you’ve passed the bar, taken the oath of attorney, and picked up your bar card but are still searching for a position, make sure you keep these suggestions in mind. Anyone who has been unemployed or underemployed knows that it is an extremely difficult experience. Unemployment can leave you feeling demoralized and isolated. It may lead you to question your choices, your abilities, or even your self-worth, which is why it’s absolutely vital that you find a way to stay positive and maintain your self-confidence while job hunting. Resist the urge to revel in self-pity and make sure you get out of bed at a decent hour each morning, change out of those pajamas, and stay busy. It can be difficult to stick to a schedule when you don’t have work or school to anchor your day, but having a healthy routine can help you maintain a positive frame of mind. One of the more difficult parts of job hunting – especially job hunting after you’ve invested so much time, money, and effort into law school and the bar exam – is dealing with rejection. If there are times when you feel like you’re sending out lots of resumes but getting no response or, perhaps just as frustrating, landing an interview but not landing the job, remind yourself that you simply can’t give up! In the words of Thomas Edison, “[t]he most certain way to succeed is always to try just one more time.” No matter how frustrated you feel, don’t stop sending out resumes, completing applications, or going to interviews. Forgive me for being blunt, but beggars can’t be choosers. If you’ve been holding out for the perfect job or been selective when sending out your resume, consider expanding your search. Start applying for everything – even if you think it’s not the ideal position, it’s not a great salary, or your qualifications aren’t a perfect match. The goal here is to get your foot in the door – anywhere – and start getting some legal experience. Your first job as a licensed attorney does not need to dictate the rest of your career. Think of it as stepping stone on your way to your larger goals, and be willing to take anything that will get you experience and give you the opportunity to work your way up. If you’re certain that you want to work as a practicing attorney, then you should definitely look for positions that allow you to do that. 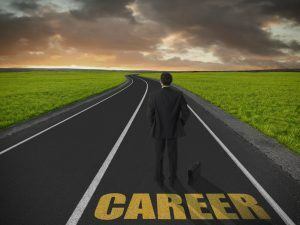 However, if you’re open to other career options, don’t hesitate to consider careers that prefer a J.D. but do not require one. There are many alternative ways to make use of your legal training. If practicing law isn’t your end goal, widening your search to include these alternatives may help you land a great job. Just because you’ve graduated, doesn’t mean you can’t take advantage of your law school’s career services office. Most offices continue to help and support recent grads who are looking for jobs, so make sure you’re on their radar screen. Better yet, set up a regular appointment or phone call with career services to ensure that you’re up to date on any new job openings and can get the inside scoop on whether any alumni or local practitioners are getting ready to hire. Going into solo practice, especially right out of law school, is not for everyone. However, it may be a good option if you are eager to start practicing and feel capable of handling the responsibility. Of course, it’s vital that you only take cases that you are competent to handle (see Rules of Professional Responsibility, please) and that you represent your clients in a diligent way. Starting your own practice is a lot of work and a huge responsibility, so it’s not something that should be entered into lightly. If you’re interested in going this route, get in touch with your local bar association to see if they offer any training or support to solo practitioners and try to find a more experienced attorney that will serve as a mentor while you start building your practice. For something as important as finding a job and starting your legal career, you should accept all the help you can get. If your job hunt is really dragging on or you’re not seeing any progress, reach out to a career coach or recruiter that can provide a personalized strategy for your situation. Last but not least, try to remember that you are not alone. It may seem like everyone you know from law school is working at some fantastic job and making piles of money, but they’re not. Many, many people who passed the bar exam are still searching for a job or working at jobs that are less than ideal. The situation may seem dire in the moment, but it’s temporary. If you made it through law school and passed the bar exam, you will be able to conquer this challenge as well.